In the last week I’ve walked and cycled many miles around Florence, on the ubiquitous slate-grey stone with which its streets are paved. They cut nice textures into it to make sure it doesn’t become too slippery in adverse weather conditions. But I have walked on this stone before, in many cities around the world, and in a finely-polished form, because it is used as the flooring material in Apple’s retail stores. 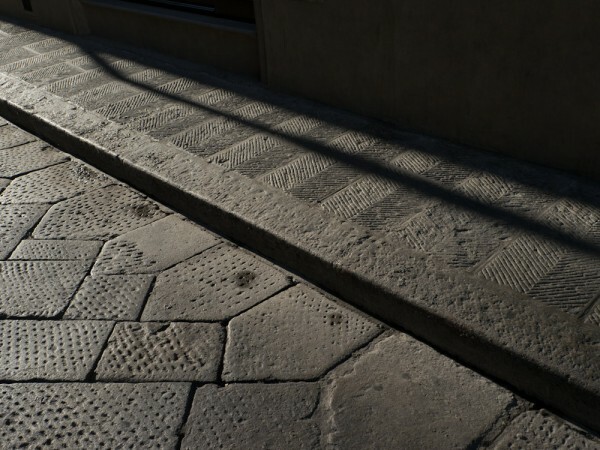 In 1985, as he was being ousted from his first tour at Apple, he had visited Italy and been impressed by the gray stone of Florence’s sidewalks. In 2002, when he came to the conclusion that the light wood floors in the stores were beginning to look somewhat pedestrian — a concern that it’s hard to imagine bedeviling someone like Microsoft CEO Steve Ballmer — Jobs wanted to use that stone instead. Some of his colleagues pushed to replicate the color and texture using concrete, which would have been ten times cheaper, but Jobs insisted that it had to be authentic. The gray-blue Pietra Serena sandstone, which has a fine-grained texture, comes from a family-owned quarry, Il Casone, in Firenzuola outside of Florence. “We select only 3% of what comes out of the mountain, because it has to have the right shading and veining and purity,” said Johnson. “Steve felt very strongly that we had to get the color right and it had to be a material with high integrity.” So designers in Florence picked out just the right quarried stone, oversaw cutting it into the proper tiles, and made sure each tile was marked with a sticker to ensure that it was laid out next to its companion tiles. “Knowing that it’s the same stone that Florence uses for its sidewalks assures you that it can stand the test of time,” said Johnson.